Last night, DH and I had the pleasure of sharing with our family and friends the wonderful news that we are having a baby boy. 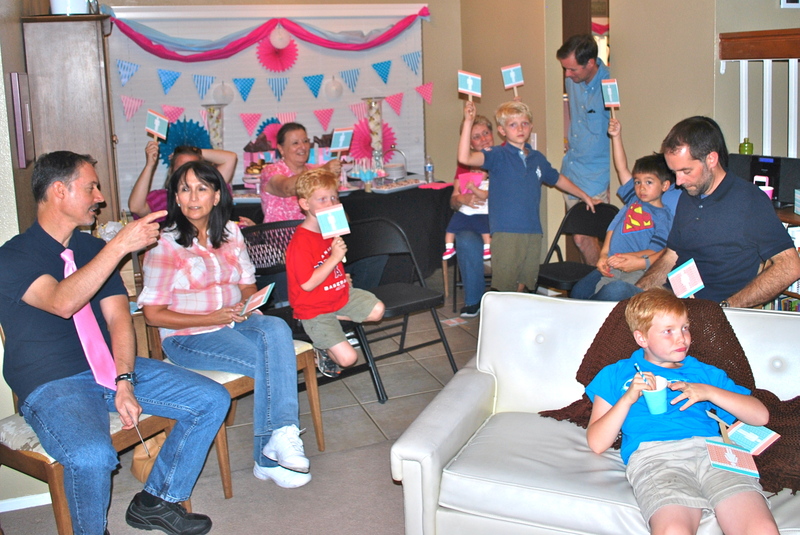 Seeing the growing trend on Pinterest, we decided to throw an official Gender Reveal Party. I made the invites and had them printed by a pro. 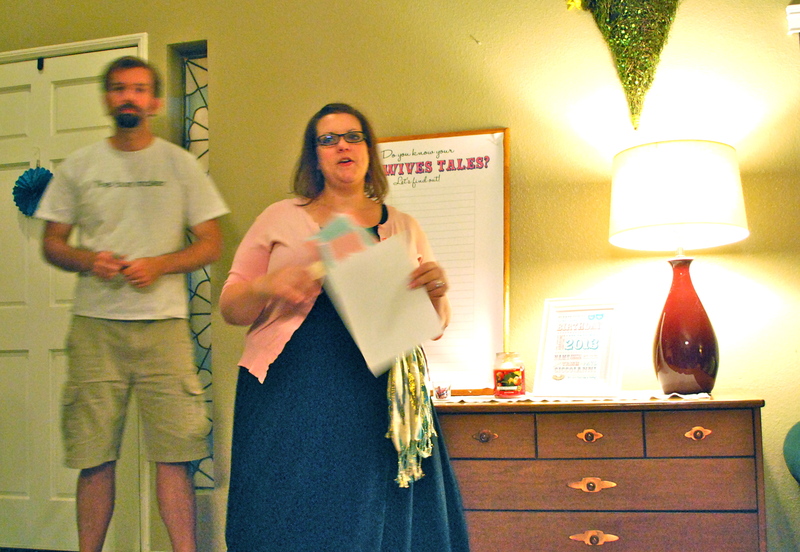 We sent them out a couple weeks before the party and were thrilled with the number of guests who responded. Since we’ve never been to a GRP before, we weren’t sure who would be interested in coming. 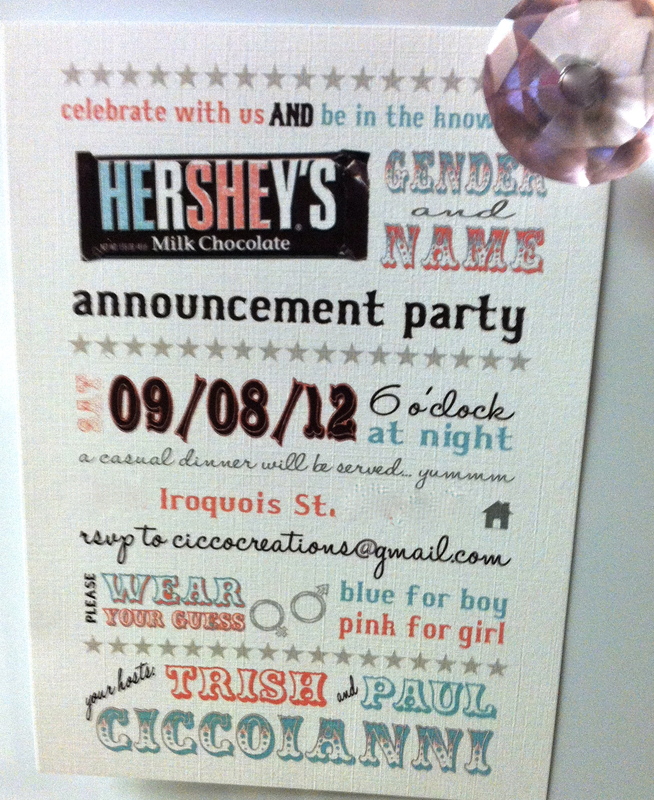 Here’s one of the invites proudly displayed on our fridge. Once the invites were out, I started planning… I wanted to plan equal parts pink and blue since I didn’t want to ruin the Big Reveal. I bought some decorations from Oriental Trading Co, including some french fry containers. I made some chocolate covered Oreos that once dipped in milk chocolate, I dipped in either pink or blue chocolate and rolled in sprinkles. 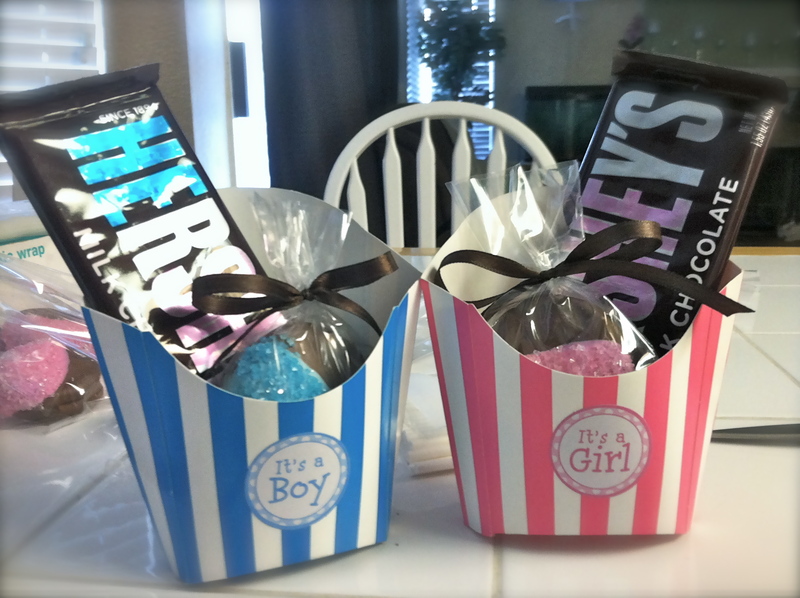 I also got some Hershey bars and colored in the “HE” and “SHE” with pink and blue marker. I added a couple other goodies, too and then put them out well in advance. The favors are almost ready. The stickers were something I added. OTC has these little boxes in other colors and they can be used for all sorts of fun purposes. 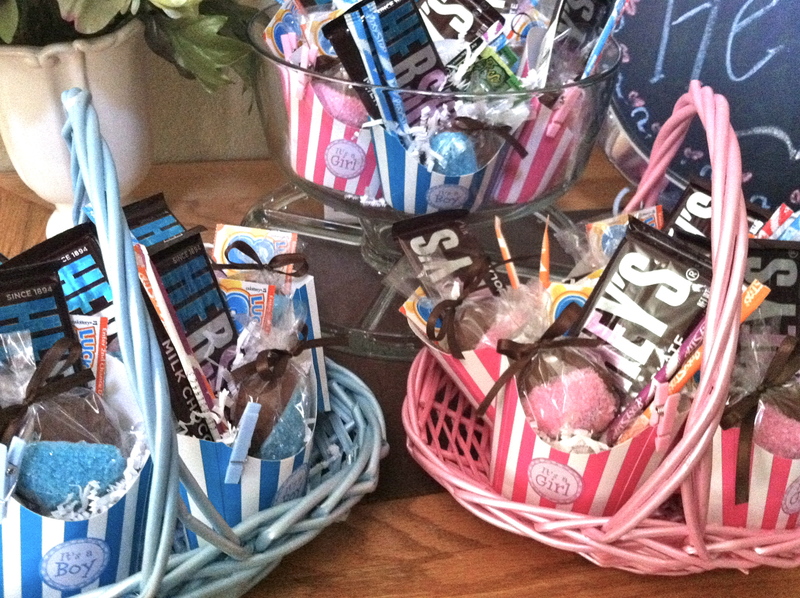 We placed the favors in our Easter baskets since they matched the theme so nicely. A day or two after all the favors were ready to go, DH came home from work to find this in the entryway. 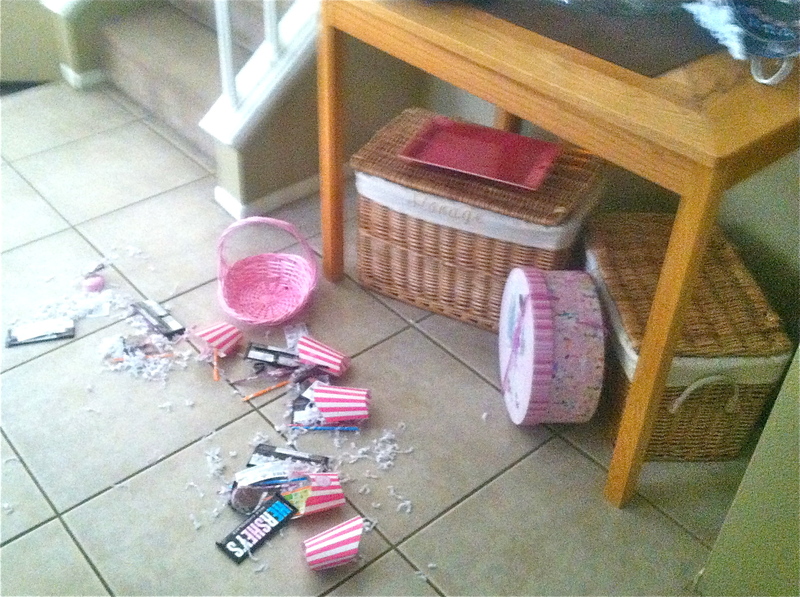 The kitties obviously had a fun afternoon! We remade the favors, and moved the baskets far out of reach from the kitties until the day of the party. For food at the party, I decided to do a pasta bar. I made some Alfredo sauce from scratch. I’ll have to post that recipe later , it’s one of my favs and gets lots of praise every time I make it. But for the red sauce, we went to Spaghetti Factory and bought a couple pints of their delicious meat sauce. It’s one of my absolute favorites, so I used this party as an excuse to get some. We served two types of pasta, fettuccine and gluten-free rotini, fresh French bread, salad, and a fresh veggie tray. My mom helped by bringing a crockpot of meatballs and we grilled up a few chicken breasts, too. It was a delicious but still relatively simple array of yumminess. 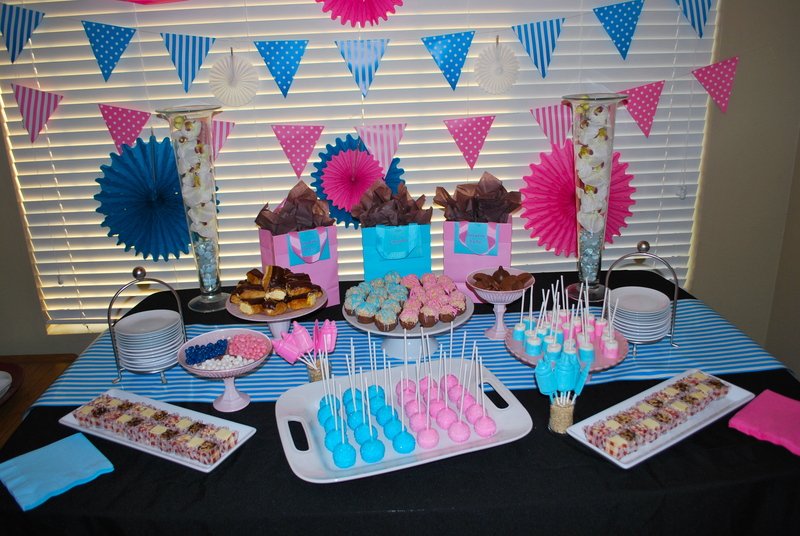 For the desserts, I wanted a fun array of pink and blue. 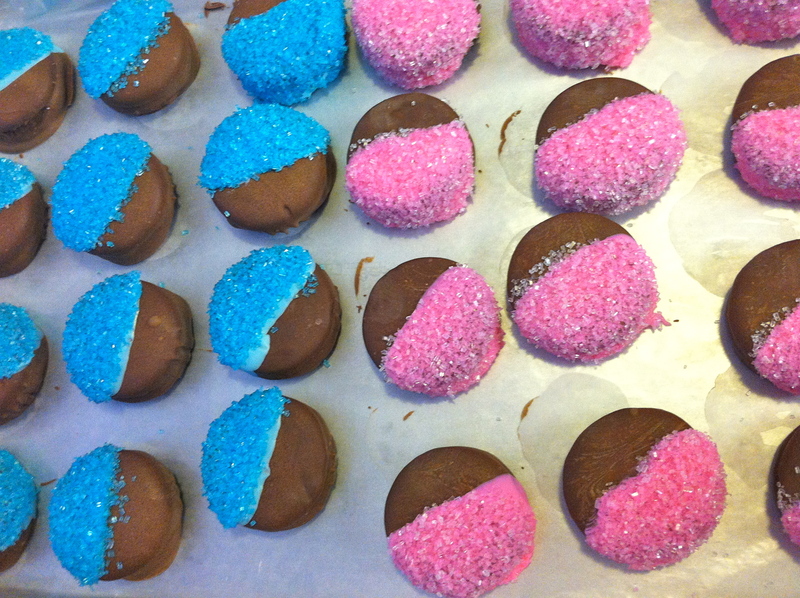 My friend Kristin made cake pops in pink and blue. DH and I made rice crispy treat balls, dipped in milk chocolate and drizzled with pink and blue chocolate. I put some marshmallows on a sucker stick and dipped them in pink and blue chocolate, too. And, my own personal indulgence, I got some of the cheesecake squares from Sam’s Club. They are so yummy and a fun dinner party is a great excuse to get them! All the yummy treats looked so bright and festive. The decorations from OTC added a lot of great color, too. The gift bags on the back of the table were gifts for the grandparents. Once everyone ate, we got down to business. We started by playing an Old Wive’s Tales game. I shared certain symptoms I have had, and asked guest to vote if they think the baby is a boy or girl based on the OWT. I handed out little paddles for people to hold up to show their vote. According to the final score, the OWTs had girl in the lead, but only by 1. DH kept score on a big score board we’d made while I read the questions. After the game, it was time to let the cat out of the bag… literally! We tied a blue bow around Troy’s neck and helped him into a duffle bag. We placed the bag on the coffee table and let him out! 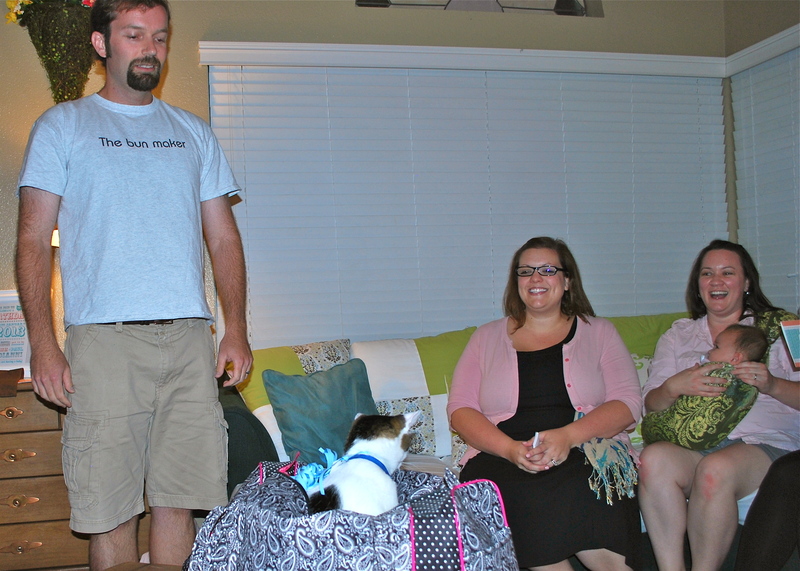 He was a bit bewildered by the excitement, but I think he actually enjoyed the attention. After we announced the gender, we also announced the name. This time, though, we included everyone instead of just the cats. 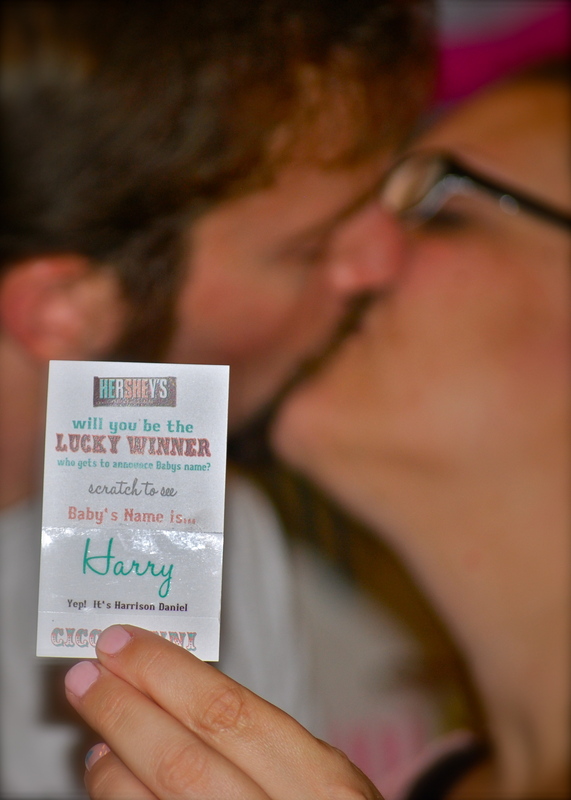 I made some lottery tickets that had the baby’s name hidden under the scratch off part. Everyone scratched at the same time, and we waited for the lucky winner to share the name. 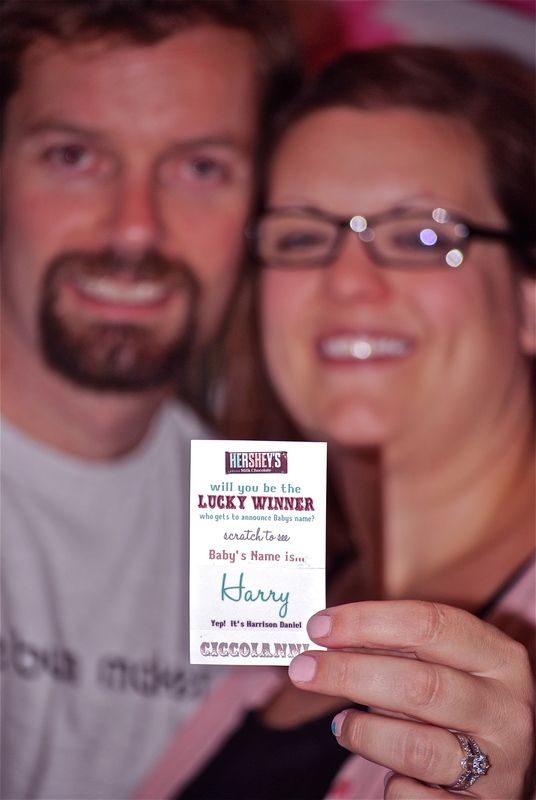 The winning ticket happened to be handed to DH’s mom, so Grandma Katie got to tell everyone that Baby’s name is Harrison Daniel, nickname Harry. The scratchers were a fun way to announce and I will have to make a how-to post later (they were really easy!). There’s the winning ticket on top of the stack! Once the gender and name were announced, we continued to enjoy the food and company. We posed for a few pics, too. 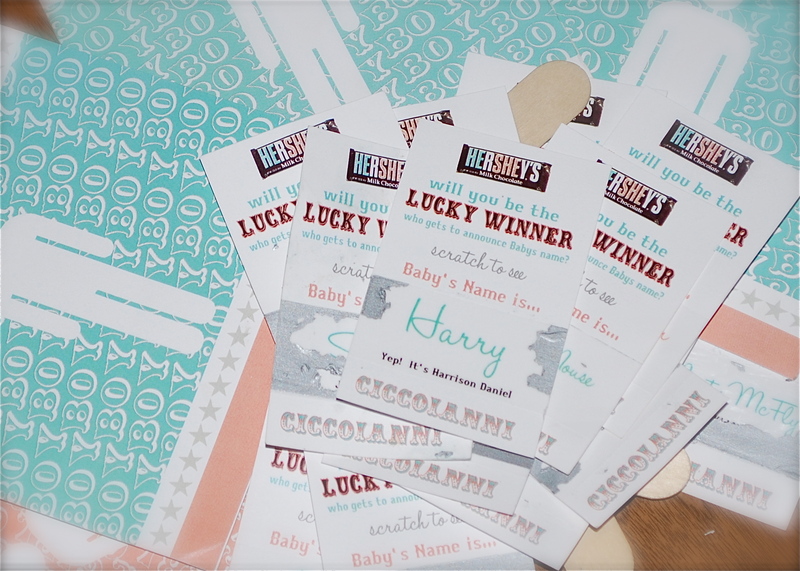 We are so happy and can’t wait to meet Baby Harry face to face this January!